Caption : TDP activist Dunna Yesuratnam, who portrayed Chief Minister Y.S. 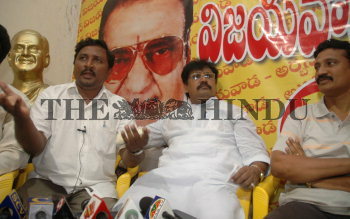 Rajasekhara Reddy's role in October 19 protest rally, addressing a press conference along with TDP SC Cell leader Varla Ramaiah and urban president Gadde Rammohan, in Vijayawada on October 22, 2006. PHOTO: RAJU. V.